1. DO YOUR PART IN THE FANS REVOLUTION! 2. Get 10 HARD-CORE FOOTBALL FANS to help you Blackout Super Bowl commercials. Fill out THE GREAT SUPER BOWL BLACKOUT and send it to 10 Fans. 3. 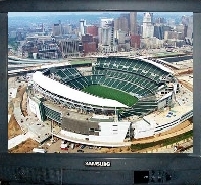 10 to the 8 Power = 100 MILLION FANS SWITCHING CHANNELS EVERYTIME THE COMMERCIALS COME ON! 5. Then talk up the THE GREAT SUPER BOWL BLACKOUT on Sports Radio, post this page on Message Boards, get the buzz going in Chat Rooms! 6. 100 MILLION FANS BLACKING OUT SUPER BOWL COMMERCIALS WILL BE A BIGGER SHOCK TO THE SYSTEM THAN LAST YEAR'S HALFTIME SHOW! 7. 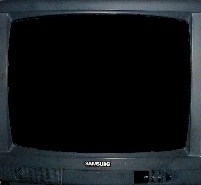 100 MILLION FANS BLACKING OUT SUPER BOWL COMMERCIALS WILL BE A THE CLEAREST SHOW OF UNITY THAT "WE CONTROL THE TVs!" 8. 100 MILLION FANS CONTROLLING THE REMOTE WILL EMPOWER FANS AND CAUSE A SHIFT IN POWER THAT SPORTS IS IN NEED OF! 9. 100 MILLION FANS SITTING ON THEIR BUTTS (or just standing around), NOT WATCHING COMMERCIALS, BY POINTING AND CLICKING THE REMOTE THAT'S ALREADY IN THEIR HAND IS AS SIMPLE AS IT GETS! 10. GETTING 10 FANS TO ACTUALLY SEND THIS PAGE TO 10 FRIENDS IS THE HARDEST PART! Week 13 blackouts. 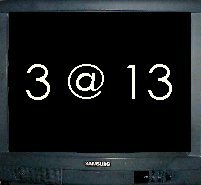 "Weak 13" attendance. Listen to this one! Week 12 blackouts. At this point of the season, the Arizona Cardinals could fill their stadium almost two and a half times with the number of non-sold tickets this season. What's wrong with that picture? Back on track, tracking blackouts; here are Week 11 blackouts. 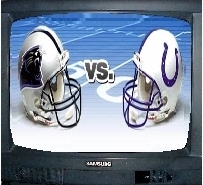 Football Fans had Desperate Housewives crammed down their throats at the end of Week 10. The only question is, when are Fans going to get desperate enough to cram the BLACK CRUSH down the networks' throat? Week 9 blackouts. Now that the NFL has extended its TV deal, is there any better reason to get focused on BLACKING OUT COMMERCIALS? Week 8 blackouts. Watching NFL games on TV is a treat, but the NFL's blackout policy makes it tricky. Once NFL Fans understand the POWER we have with our remotes, we can turn the trick of CRUSHING the policy. Week 7 blackouts and a SHOUT OUT to Phil Barber of the Santa Rosa Press Democrat for his article Playing NFL's blackout game. Week 6 blackouts. Pudding: A different twist to an old problem and a whole new level of Fan Activism! Week 5 blackouts. The numbers are CRAZY! Week 4 blackouts had the one of the largest crowd deficiencies of all time and DirectTV is still blacking out games. 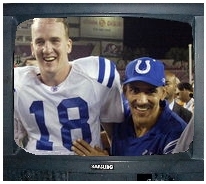 Week 3 blackouts and the NFL Network on Demand got into the picture. Week 2 blackouts have NFL Fans from the West Coast to the East Coast, from the North to the South sounding off! Listen in. The NFL blackouts are back and so is the BLACK CRUSH BUS. All the NFL wants Fans to do is sit down, shut up, watch commercials and drink beer. TRUE. OK it's official. 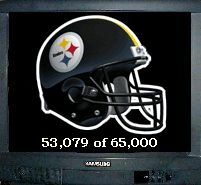 With only 52,527 in attendance against the Chargers, Pittsburgh really is a blackout town. It's a sad reality, but it's reality nonetheless. The Jaguars getting blacked out has been a reality for the past few seasons, so the sparse crowd of 49,207 that watched the Saints kick their play-offs hope away, is pretty standard down there. But the Colts are rolling to the play-offs and possibly a Division Title. So why were they 3,123 shy of a sellout against play-off-bound Denver? A week later and everything is back to normal. 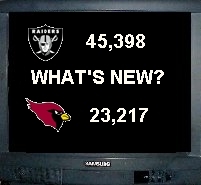 The Raiders drew 45,398 and the Cardinals drew 23,217. But what's up in Indianapolis? The Colts only drew 57,103. That's 3,169 short for a team on their way to the play-offs. What's the world of pro football coming to when the Steelers get blacked out? The PITTSBURGH STEELERS!!!!!!!!!!!!!! Jacksonville Jaguars had their lowest attendance of the year last Sunday, but the PITTSBURGH STEELERS?????????????? Unlucky Week 13 blackouts for the Chargers, Raiders, and Jaguars. San Diego lost to the Chiefs and only drew 57,671. The Raiders got beat by the Broncos in front of just 57,201 fans. The Jaguars beat the Buccaneers, but 13,257 of the 73,800 seats were empty. New HOT SPOT: San Diego. Qualcomm Stadium holds 71,294, only 52,069 showed up for the game with the Bengals; 9,980 more than the Cardinals/Rams game. Probable Week 13 blackouts: Chiefs at San Diego; Bucs at Jacksonville; Broncos at Oakland. At 9-2, the Colts shouldn't get blacked out. What a difference a week made in Cincinnait. BIG win blacked out against Houston. BIGGEST win on TV against the Chiefs, ending their Potentially Perfect Season. CONGRATULATIONS CINCINNAITI! Probable Week 12 blackout: Rams at Arizona. Possible: Bengals at San Diego. New HOT SPOT: Cincinnati. 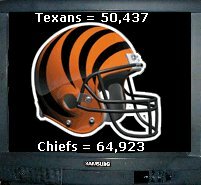 Paul Brown Stadium holds 65,535, only 50,437 showed up for the game with the Texans. 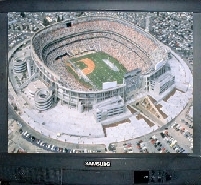 Usual HOT SPOTS: 35th Anniversary "Heidi Blackout" between the Raiders and Jets was blacked out in Oakland. Indianapolis at Jacksonville continued the Jaquars "Season in Darkness." Possible HOT SPOT: San Diego since NFL.com officially reported the Chargers/Vikings game as "Paid Attendance: 00,000." VERY INTERESTING. 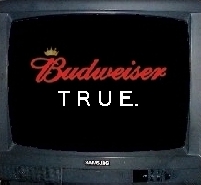 Either Budweiser is on the BLACK CRUSH Bus, or "it's just my subliminal imagination, runnin' away with me." What has this Website POUNDED UP THE MIDDLE from the beginning of the season? Change the channel; create drama! BLACK CRUSH Second Anniversary. From Poppa's Pub-sponsored booth at the KJR Sports Radio 1st Annual (and Last) Sports FANtasy Weekend, WeTheFans.com took the (originally named) "Turn The Lights On, The Party's Over" NFL Blackout Petition straight to the FANS of Seattle. But Seattle's only sports radio station turned straight from it. The FANtasy was over! Despite all the HARD talk against the NFL Blackout Policy, the station has always been soft on the FAN-led-grass roots-Web-based protest against it. And that's just the "tip." The battle between two of the NFL's UNbeatens was on TV in Indianapolis. But no one saw the Ravens beat the Cardinals in Arizona on TV (only 24,193 saw it at Sun Devil Stadium), or the Jaguars' loss to the Dolphins in Jacksonville. Despite the Seahawks' BIG, sold-out, home win against the 49ers on Sunday Night Football, Seattle is back on "blackout watch" with 2,300 unsold tickets for their game against the Bears. Other Week 7 BLACKOUT Hot Spots: Oakland hosts the Chiefs; Arizona, Jacksonville, and Indianapolis have byes. One of the GREATEST Monday Night Football games ever, right? What would have happened had it been played in Indianapolis? The Colts are 5-0; both home wins were blacked out. If last night's game was in Indianapolis and not sold out, the league's blackout policy is so RIDICULOUS, that game would have probably been in the dark. The NFL is so RIDICULOUS about its policy, it blacked out a nationally televised Sunday Night Game in Seattle while a publicly-financed Seahawks Stadium was under construction. Week 6 BLACKOUT Hot Spots: UNbeaten Carolina play the Colts in Indianapolis; Miami at Jacksonville; Baltimore at Arizona. Raiders are on the road in Cleveland; Seahawks are sold out for the 49ers game. Blackouts on the horizon: San Diego; New Orleans. Who wants to spend GOOD money for BAD product? Shouldn't the Raiders be ALL THE WAY BACK? Eight seasons after the move BACK to Oakland, they went BACK to the Super Bowl. Shouldn't they be BACK filling up the Oakland/Alameda (Network Associates) Coliseum? What's up down there? Definitely a much different climate than in Seattle. Nextel, Home Depot nor any other company stepped up to buy a block of tickets. But then again, 9,000 is three times the block that was knocked off in Seattle last week, but only 60% of the remaining Seahawks tickets three weeks ago. Raiders/Chargers was a GREAT AFC West game and a BIG home win. Raider Fans can read the Recap, Game Stats, Play-by-Play, and Game Book. But this game NEEDED TO BE ON TV IN OAKLAND! Next week the Raiders are in Chicago; TV in Oakland. The only blackout Week 5 HOT SPOT is Jacksonville; Seattle, Arizona, Indianapolis are all on the road. 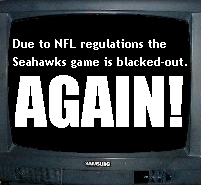 The Seahawks/Rams game was a "Blackout on TV" thanks to Home Depot and Nextel. Despite it's usual 24-hour extension, the Hawks still had 3,000 tickets left before Friday's 1:pm second deadline. So for all intents and purposes, this game was a blackout, but wound up on TV because of corporate sponsors. The Cardinals impressive win over the Packers was blacked out. Jacksonville and Indianapolis, both blacked out last week, were blacked out together in Indy. The Jaguars, Colts, Raiders and Cardinals join the Seahawks as teams with blacked out home openers in 2003. Read the History of Darkness in Seattle. House Bill 1740 met with "Sudden Death" in the Technology, Telecommunication & Engergy Committee and will not get to the Floor of the House. Details are sketchy, so please Email the Committee Members and Bill Sponsors to find out WHAT THE HECK HAPPENED? Eight of the 17 Committee Members are Bill Sponsors which includes the Chair and both Vice Chairs. Why couldn't they swing TWO votes? That's like not being able to make the two-point conversion in a one point Wild Card game, isn't it? MORE INTERESTING: 9 Democrats; 8 Republicans. Who really killed House 1740? Washington State Representative Sam Hunt with Commando Dave. The The BLACK CRUSH Bus gases up to support Rep. Hunt and Sen. Jarrett by "registering" Fans, Taxpayers, and Voters. 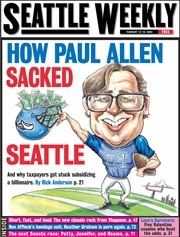 Rick Anderson masterfully detailed the Seahawk Stadium's Public/Private Partnership in the Seattle Weekly. Rep. Sam Hunt introduced House Bill 1740 prohibiting NFL blackouts in publicly funded stadiums. Senator Marilyn Jarrett of Arizona introduced Senate Bill 1017 prohibiting NFL blackouts in publicly funded stadiums. 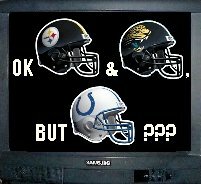 WeTheFans.com appropriately renamed the NFL Blackout Peitition. House Bill 2838 was gunned down in the Senate Committee of Senator Marqarita Prentice. House Bill 2838 Tommy-gunned its way through the House of Representatives with a rapid-fire 95-3 vote. Representative Sam Hunt of the Washington State House of Representatives introduced Bill 2838 prohibiting NFL blackouts in publicly funded stadiums. WeTheFans.com kicked off the "Turn ON The Lights, The Party's Over" NFL Blackout Petition as an exhibitor at the First (and Last) Annual KJR Sports Fantasy Weekend.